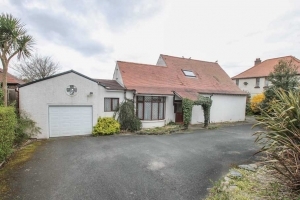 From St Ninian’s traffic lights proceed along Ballanard Road, the property is on the left hand side shortly after the entrance to Tromode Park, clearly identified by our ‘For Sale’ board. Spacious entrance hallway with stairs leading up to the first floor with a Cloakroom and cylinder cupboard off. Coal effect electric fire with brick feature fireplace. Bay window and beamed ceiling. Double doors leading to rear garden. Fitted with base and wall units, work surface with single drainer stainless steel sink unit. Plumbing for automatic washing machine. Oil fired central heating boiler. Fitted with a white suite comprising shower cubicle with plumbed in shower, wash hand basin, toilet and bidet. Fitted with a white suite comprising shower cubicle with plumbed in shower, wash hand basin and toilet. Fitted with a white suite comprising bath with plumbed in shower over, wash hand basin and W.C. Skylight window. The property occupies a particularly generous plot, in a well established and sought after location. Tarmacadam frontage with excellent off road parking facilities. Turning space. Large rear garden mainly set to lawn with mature tree, shrub and bed borders. Two ornamental ponds.